Written by Jen; Approved by Ian. There has been many a day when I've walked down the stairs to go to work, and Ian takes one look at me, smiles, and says "do you think you're going on safari today?" Well, of course I know that I'm not going on safari. But I can pretend. For the record, we're talking about a military inspired dress accented with high-healed wedges and chunky silver jewelry, with far too many leather bracelets, not khaki shorts with with a matching khaki button down shirt, lace up boots, and a safari hat (which according to the internet, and the internet is never wrong, is defined as a fedora with the brim turned down). Think someone going for the Ralph Lauren safari chic look or those ads from a few years of ago of Bono (U2) in the bush with a Louis Vuitton bag, and not Hugh Jackman's character in Chappie (it's a good movie if you haven't seen it). American author Henry Miller said: “[o]ne’s destination is never a place, but a new way of seeing things.” And, one of the things I've learned from building my safari wardrobe over the years is that I really like to wear earth tones, but more importantly, putting on those earth tones on what otherwise is a normal work day inevitably brings up fond memories of wearing that dress or those many bracelets in the bush somewhere in Africa. I may love being in the bush covered in dust and sweat, watching a cheetah stalk prey for hours, but as the last paragraph may have hinted at, I have a soft (irrational) spot for certain luxurious goods, like Louis Vuitton. I can't even tell you why. I just know when I see that brown leather, I want it. So, in 2010 (or maybe it was 2011), with the safari bug well in place, when Louis Vuitton released a marketing campaign featuring Bono in the bush with those gorgeous leather bags, I felt a pang of envy when the brochure showed up at our house--for the bag and to be in Africa. We did go to South Africa that year. But a few years later, unbeknownst to me at the time, I had booked us on a safari to a luxurious and unique safari location in South Africa, Tswalu, the location of that Louis Vuitton ad. Unfortunately, I did not try to reenact the Bono/Louis Vuitton ad while there as that would have made for some fantastically hilarious photos to share with you. We did though get the star treatment at Tswalu. And, what drew me to Tswalu--it's sense of remoteness, mission for wildlife conservation, and emphasis on service--proved to be true. 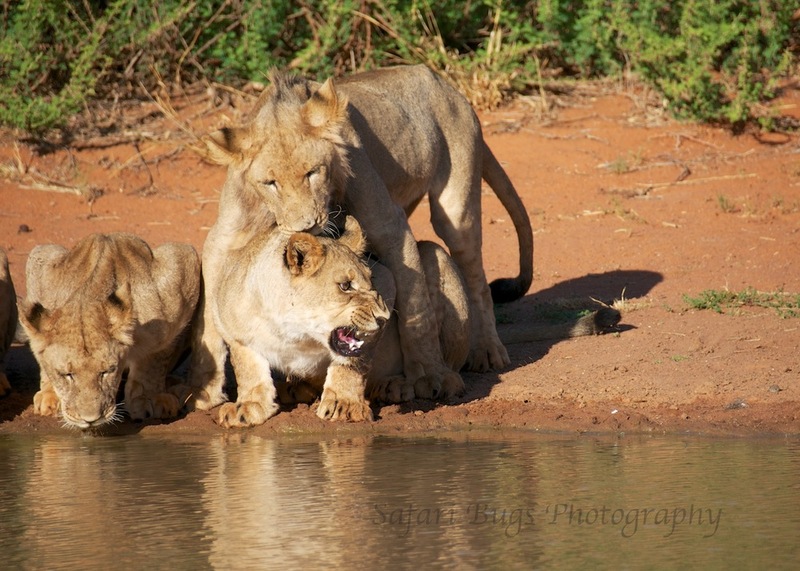 Because it's been a couple of years since we've been to Tswalu, rather than go through our day by day safari experience, I list some of our favorite non-wildlife experiences followed by photos of some of our amazing wildlife adventures. The Views. Even though landscape photography is not my first love, the above photos speak for themselves. The Spa. I had a massage that equals that of any five star resort spa (and I could write an entire blog on my various resort massage experiences). The Service. They offered us things I couldn't think of myself like freshly made iced tea available on demand on our room deck, yoga by the pool post safari drive, and a pitcher (a real pitcher) of gin and tonics with a green flare for our evening game drive. Ian enjoying one of those gin and tonics with a special ingredient (looks healthy, like a green smoothy!) while viewing a pride of lions (more about those lions below). The Pools. That's right, two pools, one of which was heated. We were there at the end of November. 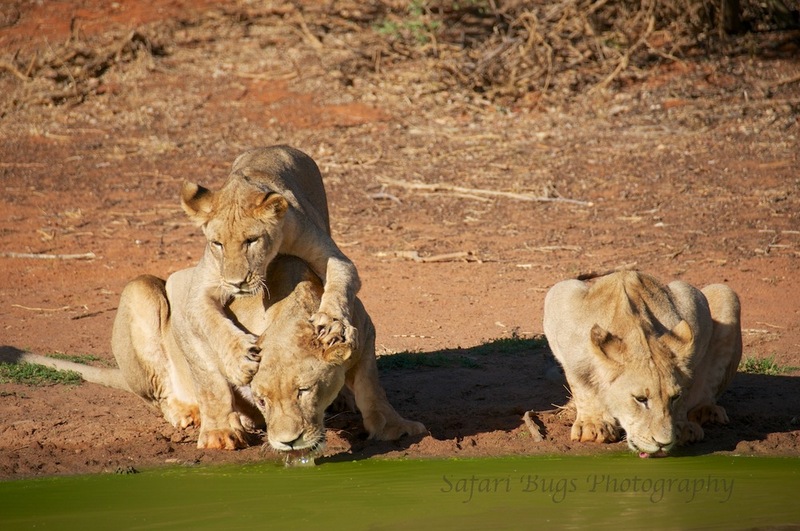 So, we had long, warm days, perfect for laying by the pools, watching the game come in for a drink at the waterhole (or the third pool if you are feeling adventurous). Sleeping Under the Stars. After one of our evening drives, we ended the evening at a raised platform with a bed, covered with thick blankets and a multitude of pillows to celebrate Ian's birthday alone, under the stars. There was even an outdoor shower and a bathroom (of sorts). We had a fire, a grill to warm up our food, champagne, a wide array of alcoholic drinks to chose from, and even a decadent chocolate birthday cake (some photos to scroll through below). The Food. It was good; all of it was very good. You Make Your Own Schedule. Part of the safari that we booked included a private guide and tracker. So, we had the vehicle to ourselves and could plan our own schedule for the day--when we wanted to go out for drive, for how long we wanted to be out there, and what wildlife we wanted to try to see. The Conservation Vision. 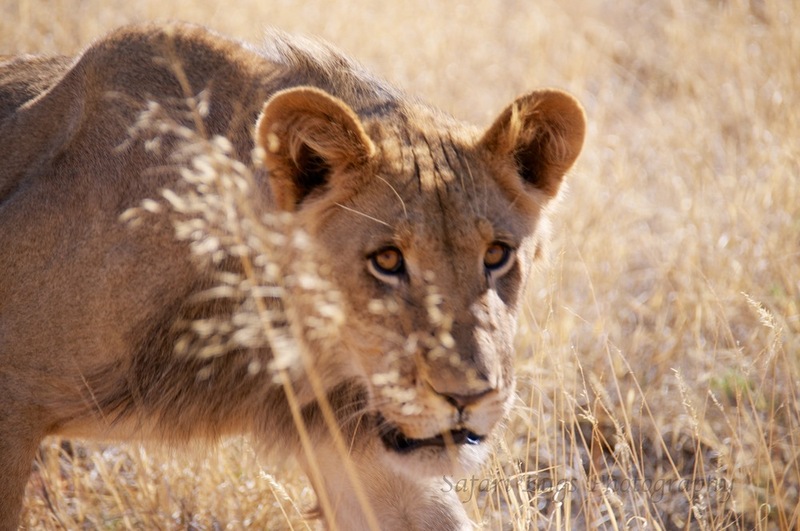 "Tswalu Kalahari is driven by two ambitions; to create an inspirational experience for its guests, and a conservation vision, to restore the Kalahari to itself. . . . Tswalu Kalahari is primarily a conservation area. 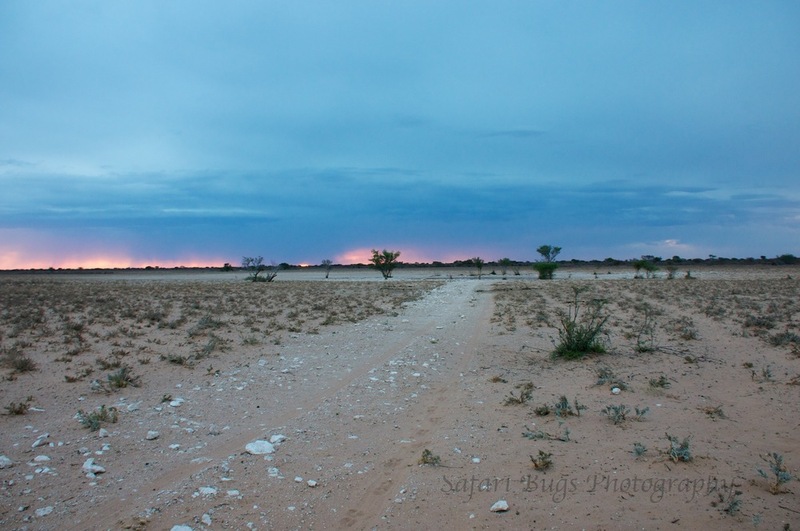 It aims to restore the area of approximately 1000km2 of Kalahari savannah to a pristine state. Such a vast area offers a safe haven for many endangered and rare species while protecting an area of unique diversity and beauty." And, when you are there, this commitment to conservation is evident. The guides are particularly knowledgeable and excited about Tswalu's conservation ethos, and it can't help but rub off on the guest. And then, it was time to rest. Remember that amazing looking green gin and tonic Ian and I were drinking? We decided that it would be a good idea to drink our pitcher of it with the lions as the sun set. Despite our best efforts, it took us some time to finish off those drinks, and by the time we were ready to go so were the lions. We followed them until they settled down. We then spent a bit more time with them. When we decided it was time to go--a combination of hunger and the call of nature urging us to get back to the lodge--the vehicle would not start. It was dark, and we were surrounded by lions; lions we couldn't see, not even with the flash of the camera. A good reason not to go walking in the bush at night. Where are those lions? Are those two eyes? We talked, somewhat seriously, of trying to jump the vehicle, but decided that as we couldn't see the lions, it was a bad idea for anyone, even the ranger, to leave the vehicle to give it a push. So, we called in for help, and as the second vehicle arrived, the lions moved off. In ordinary, everyday life, your car not stopping is a major stress. But, stuck in the bush with some lions, pure excitement (as long as you are in the vehicle, of course). Though being on foot to view the meerkats is a very special experience, what may have been more exciting was spotting some meerkats outside of our room with a female Nyala. I have more recent trips, with 1,000s of photos to sift through, that possibly should have been my next post. I can't say some of it wasn't in part procrastination, but my main impetus to write about Tswalu now was that I couldn't stop thinking about this extraordinary safari destination. At the time I started this post, we were experiencing some of the worst rain that we had encountered in recent memory. And, it lasted for days. Not surprisingly, I thought of our time at Tswalu. We were there at the end of November, with long, sunny days. And, when I looked out the window to see what felt like endless rain, my brain kept bringing up my happy, sunny memories of Tswalu. It's those memories made while traveling that sometimes help me get through those rainy (real or perceived) days--the sun accentuating the red sand, being treated like a rockstar, napping outside in the shade, sweet tea on the verandah, cooling off in the pool, the sound of lions lapping up water, falling asleep during a massage, seeing the sunrise and the sunset in the same day, watching the clouds build with the possibility of evening rains, Ian's relaxed smile as he enjoys a Cuban cigar, following the tracks of a rhino, having a good laugh while being marooned and surrounded by invisible lions, sleeping under the stars, champagne in the bush . . . .
*FYI - This trip was planned by our wonderful travel agent, Jeanie Fundora at www.travelbeyond.com. A trip to Tswalu pairs nicely with a stay in Cape Town. 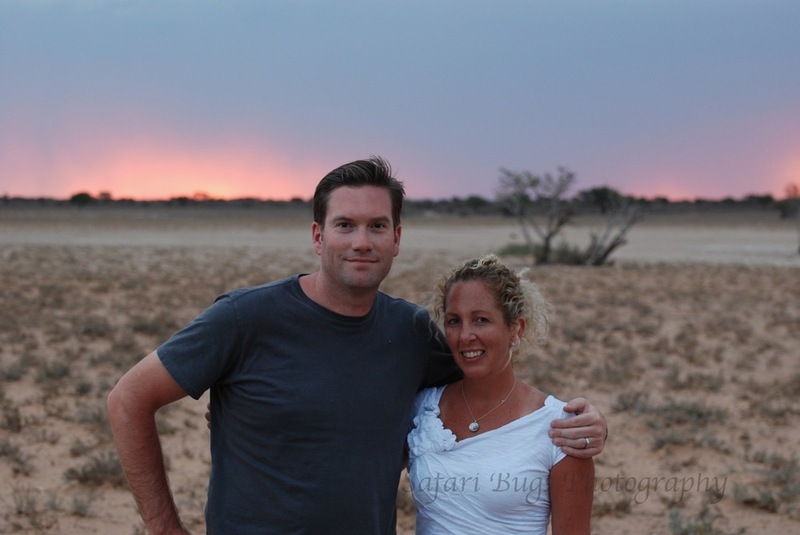 On this trip, we spent the first 5 nights in Cape Town followed by a stay at Tswalu.